These stories are typical, rather than being unusual. If you have any Every Day Horror Stories of the Mental Health System that you would like to be posted or listed here, please e-mail info@psychrights.org. Of course, we will have to decide which ones meet our editorial guidelines. However, this is meant to be inclusive, rather than exclusive and if there are just stories on the web that should be listed here, you can send us the web address. If you want to write a story and send it to us, we can post it. We really do need them in some sort of electronic format, however. Why are they not listening? A Mother's Very, Very Worst Nightmare. Sterilising the Mentally Ill is Not a Side Effect. A Modern Day "Cuckoo's Nest", the Institutional Incarceration of Mental Health Consumers. 3-year-old in CPS' care overprescribed psychotropic drugs, Fox News Houston. 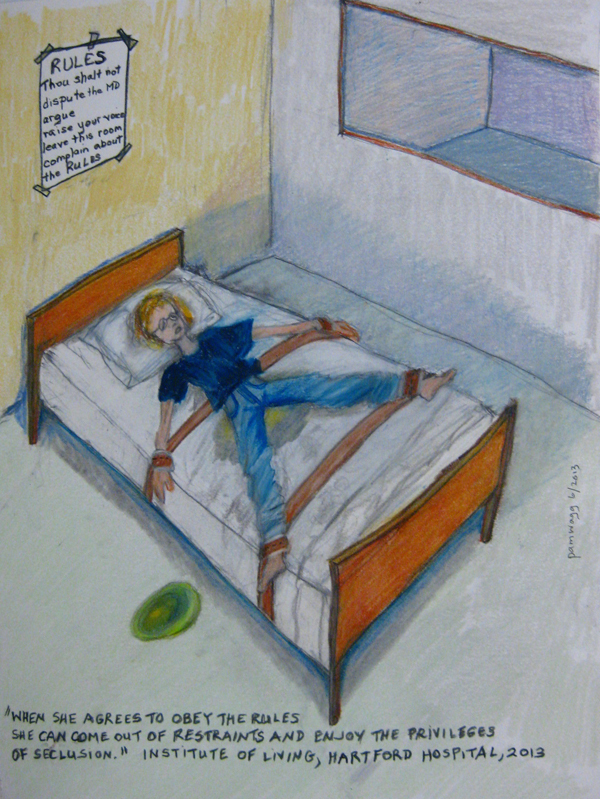 Jeffrey James – Death by "Restraint"
Dear MindFreedom (Kenneth D. Salo, Jr., January 14, 2008). Psych Drugs Drove My Son Crazy (happy ending). A Hidden Shame: Death in Georgia's Mental Hospitals. Three and a half years on Zyprexa. I Made a Horrible Mistake by Committing My Sister: Her Life is Still Hell Eight Years Later. Can anyone help? A Suicide Side Effect? What parents aren't being told about their kids' antidepressants. San Francisco Chronicle, January 4, 2004. Sue Clark's Psychiatry Buster Page about Electroshock This page has an instrumental version of John Lennon's "Imagine" on it. Virginia Board of Medicine Decision denying Dr. Stein's application for reinstatement of his medical license. Lived tragic lives, died tragic deaths Five young people victims of system. Eric Harris was taking Luvox (a Prozac-like drug) at the time of the Littleton murders by Peter R. Breggin, M.D. New York Times Article, The Adult Home Scandal, April 30, 2002. New York Times Article, Voiceless, Defenseless and a Source of Cash, April 30, 2002. New York Times Article, Here, Life Is Squalor and Chaos, April 29, 2002. New York Times Article, For Mentally Ill, Death and Misery, April 28, 2002 (In Anchorage they die on the streets). SSRI Stories is a compilation of news stories involving people on SSRIs who did terrible things.